After looking at how other bloggers approach goal setting, I decided monthly goals broken down into weekly lists might be the best way to keep me on track. 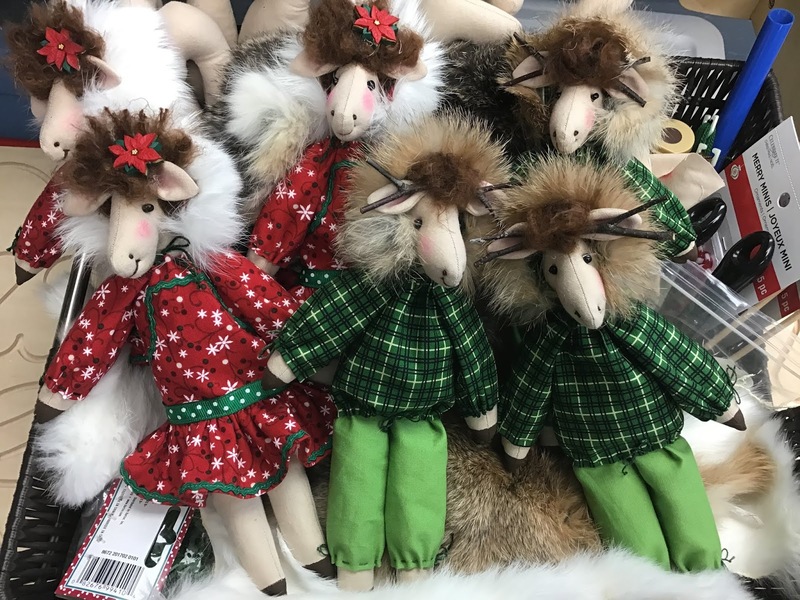 Completing the three sets of Christmas Moose dolls had been on my list twice for weekly projects. I am now officially ahead for gift giving next Christmas. These dolls are not difficult but they sure are time consuming. On Saturday I had a Sew-In with my Material Girls quilting group. There was a little show and tell which I mostly didn't photograph but there were three quilts from Sharon that had an amazing story. Forty-one years ago, Sharon's mother and brother were on a road trip to come and visit her when they were killed in a car accident. Recovered from the wreckage was a set of applique butterfly blocks. Some of the fabrics had scraps from clothing family members had worn. Over the years, Sharon and her sister-in-law, Joyce, who is also a member of Material Girls, made more butterfly blocks. The family experienced another life event when there was a house fire. The butterfly blocks survived though some got a little discolored. Sharon has three daughters and decided to make three quilts from the blocks. 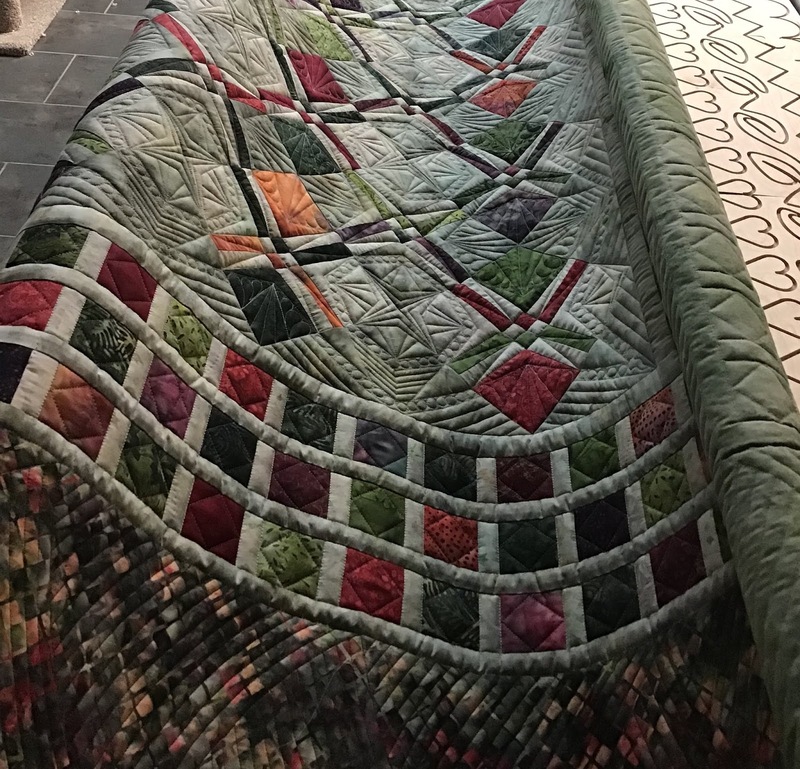 Each quilt has a different border design. 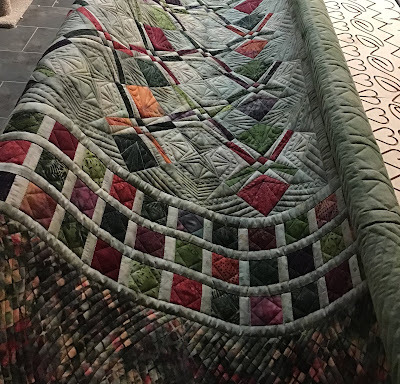 While being quilted by a Material Girls member, the November 30th earthquake hit and one of the quilts in the quilting frame got a small hole Sharon was able to repair. 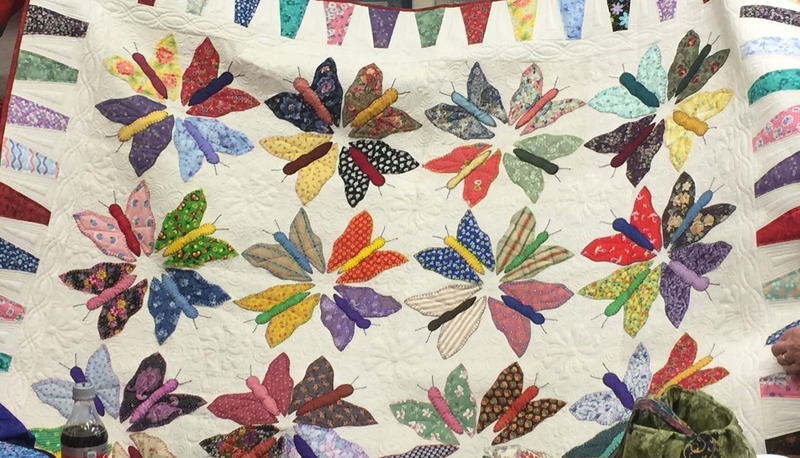 The stories quilts tell...this one was 41 years in the making. It gives one new hope for those UFOs you keep for so many years in your stash. I'm getting close to finishing the quilting on Batiki Argyle II. 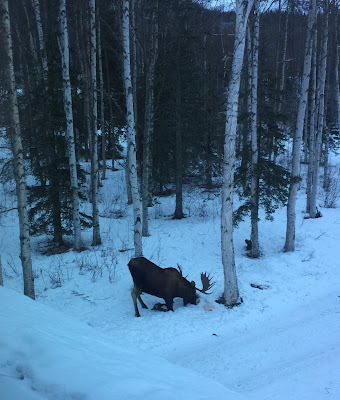 And I did say the moose were everywhere. Sunday I got texts from two of my neighbors warning me I had a bull moose in my yard. I placed a frozen pumpkin left over from Halloween on the wooded side of my driveway a couple of months ago. The pumpkin had been sitting on my front porch. Moose are known for strolling onto people's decks and porches to partake of pumpkins so I did place that pumpkin where I thought a moose might notice it without getting on my front porch. I watched him go all the way down to the ground to make sure he got every last bite of the pumpkin. Temperatures were hovering around 40-degrees most of the day after a week of sub-zero temperature. Not the best lighting situation for outdoor photos but we are gaining almost two minutes of sunlight everyday. I live in a mountain valley and the sun does not get high enough in the sky to shine on my house yet. I think I lose the direct sunlight for about two months. There are lots of cloudy days in the winter that make no difference when it comes to whether or not I get direct sunlight. OMG, I luuuuuuuv those moose! Is this your own pattern? They are just the cutest things, and good for you for getting ahead of the game. Your moose dolls are just too cute. The real one is pretty amazing! 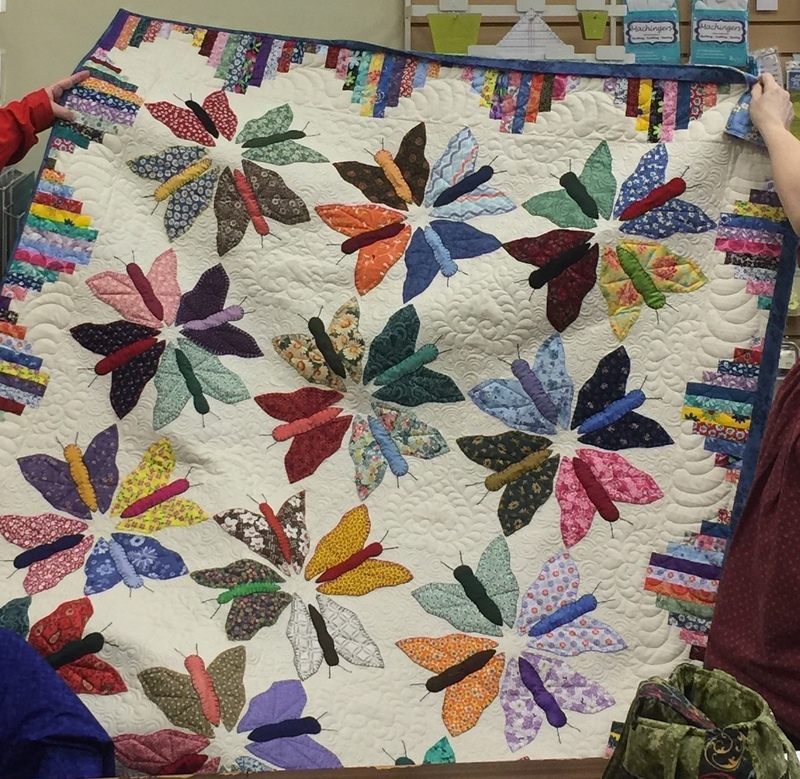 What an amazing story about the butterfly quilts and how the blocks survived all through the years. I just love those moose dolls. 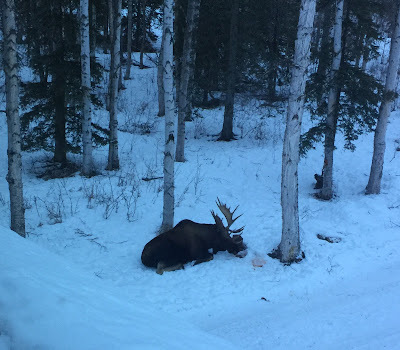 And I enjoyed seeing the pictures of the moose eating the pumpkin - what a treat for him. Thanks for sharing the Story of the Three Quilts....makes me smile to think of the legacy. And your moose figures just warm my heart....I love them! Batik Argyle is really coming along nicely...Quilting really makes the quilt, doesn't it! Stay warm. I can't imagine not having direct sunlight for up to 2 months....I get migraines in the direct sunlight but the idea of not having it makes me nuts! What a heart wrenching story of the butterfly blocks... it must be bittersweet for the family for them to now finally be finished. And oh my... those moose dolls are exquisite! Your moose are adorable! 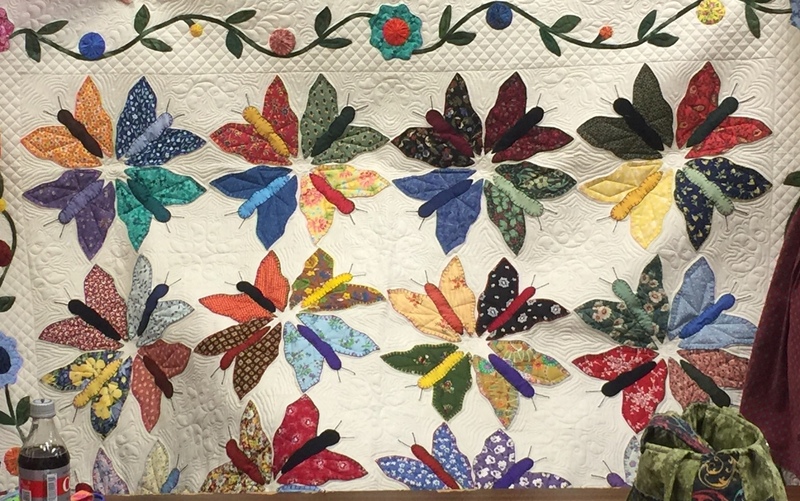 And what a neat story about the butterfly quilts. They were sure meant to be finished and here. 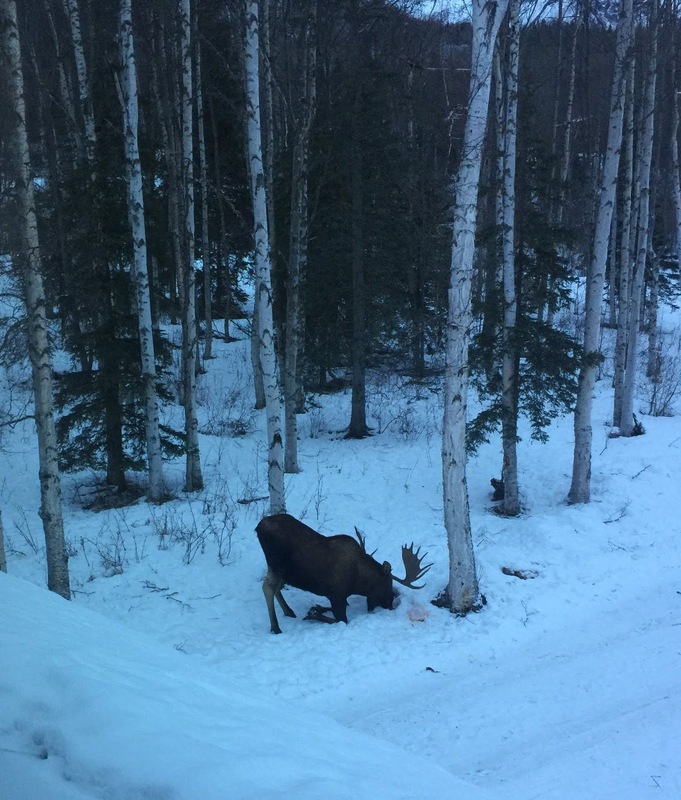 Love the real moose photos, too.